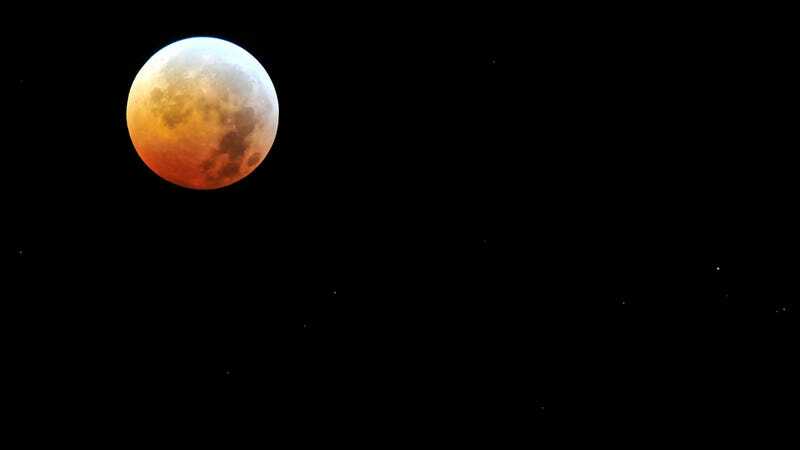 The longest lunar eclipse of the 21st century will start today at 3:30 p.m. and last until 5:15 p.m. EST (12:30 p.m. to 2:15 p.m. PST). The moon won’t rise in North America until after the eclipse is over, so no one in North America will be able to see it, except for some folks in the Caribbean (Puerto Rico included) and Newfoundland, who will catch the end of the spectacle at moonrise. This eclipse is just a few minutes shy of the longest lunar eclipse possible. It’s the longest lunar eclipse of the century, but there was a longer one in 2000, so it really depends on what your definition of “century” is (technically, the 21st century is defined as 2001 to 2100). Here’s a live feed from timeanddate.com that will begin at 2 p.m. EST. Slooh and the Virtual Telescope Project will also offer feeds from several telescopes around the world. Eclipses occur when the Moon passes into the Earth’s shadow. It appears red for the same reason that sunsets look red—the Earth’s atmosphere scatters different colors in different amounts, and more red light than than blue light makes it around the Earth to the Moon. The Moon doesn’t pass behind Earth’s shadow every full moon because its orbit is inclined with respect to the Earth’s orbit around the Sun. Eclipses only occur when the Moon, Sun, and Earth are in just right positions so that the Moon and Sun’s orbits intersect. More about that here. And please don’t call it a “blood Moon” as if it were some kind of spooky omen. It’s 2018, and we all know what a lunar eclipse is. Still, any reason is a good reason to look at the Moon, even if it’s just on a webcast.